When you tire of the temples and gardens of Kyoto and want a glimpse of everyday Kyoto life, a walk down Nishiki-koji (Nishiki market) will surely refresh your spirits. Located in central Kyoto, the narrow street, conveniently covered for the rain, has been supplying Kyoto’s residents with high-quality traditional ingredients for centuries. Although its present form and location is from the late 16th century, the market has been in place since the Middle Ages. Most of the tiny storefront shops are open by mid-morning, although professional chefs frequent the fish purveyors early to pick the best of the day’s catch. By lunchtime, the market is in full swing, and mouth-watering aromas and mind-boggling sights await at every turn: Fresh tsukemono in the vibrant hues of nature; gleaming, pristine raw fish on ice; perfectly rolled golden omelets made of organic eggs; succulent teriyaki grilled fish; the fragrance of roasted tea – all converge to entice the locals and bewilder the traveler. Add to this the singsong sound of the ancient merchant calls “oishidesu-yo” (it’s delicious!) and you feel transported to a distant time. My husband and I used to be tortured by our strolls in the past, especially when time did not allow for soaking in the atmosphere and sampling various foods, but on recent, longer trips we’ve slowly but surely gotten to know which shops we prefer, as we eat our way to bliss and some kind of rudimentary knowledge. However, it would take much longer to become a true aficionado. Food is not the only thing for sale: utensils, dishes, clothing and even geta (sandals) and tabi are also available. Almost all the necessities of daily life can be found along this narrow stretch. Restaurants, noodle shops and tea and coffee houses also provide nourishment for the hungry. Future articles will highlight various shops, restaurants and vendors. We will be in Kyoto again in May to continue our education. Stay tuned! 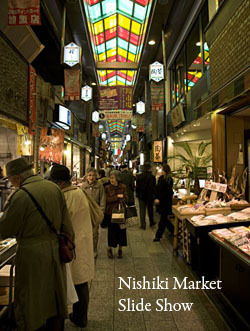 Location: Nishiki-koji runs east-west and is located one street north of Shijo Dori. The best place to start is on the east end, near Teramachi Dori. Look for the large torii gate and follow your nose west. The market is only 400 yards long and ends at Takakura Dori, but make sure you allow ample time to wander its length. Above: Nishiki-koji (Nishiki Market) consists of one narrow street which is lined with small shops that sell essential ingredients for Kyoto cuisine. Some of the vendors have been doing business for centuries, and generations of Kyoto residents have been their loyal customers.